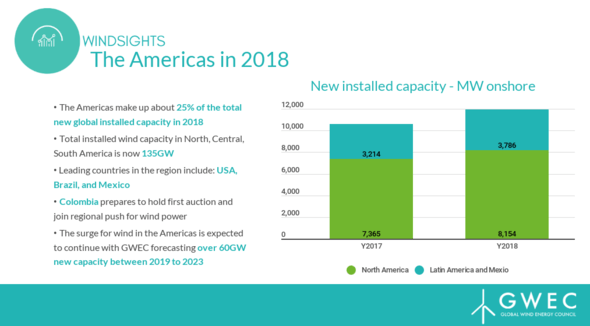 The latest data released by the Global Wind Energy Council (GWEC) show North, Central and South America installed 11.9GW capacity of wind power in 2018, an increase of 12% on last year. The GWEC data offers a really interesting detail: In different parts of the Americas, the countries use different approaches on how to increase renewable energy: In North America, the recent and final extension of the Production Tax Credit (PTC) has driven volume while in Latin America, the commitment to auctions has continued to deliver volume for the region. Ben Backwell, CEO of GWEC, comments on the development: “The North American wind market is one of the most mature and competitive in the wind industry. Many learnings and experiences from the success here can be used in other markets. The rise of corporate procurement during 2018 demonstrates how corporate sourcing can drive demand and volume in other wind markets." While up to this point, the North American market was driven only by onshore wind which has led to over 160,000 jobs (Source: CanWEA and AWEA) for people working in the wind industry. Only recently, the U.S. has also started to push for offshore wind while trying to establish a supply chain of their own. Tenders for offshore leasing zones being conducted (Massachusetts), JV formations (EDF and Shell for New Jersey leasing zones) and industry players establishing offices (MHI Vestas) are also pushing the market. GWEC expects projects to commence construction between 2020 and 2025. The Latin America region is expected to continue its growth with a further expansion of the supply chain during 2019. These latest figures released by GWEC form the statistical release of the Global Wind Report which will be released in April.